There is a shortage of office space at the Parks, Recreation, Culture and Facilities Administration Building on McDougall Street, and the city is looking to expand to the former Angileri building on Howard Avenue. 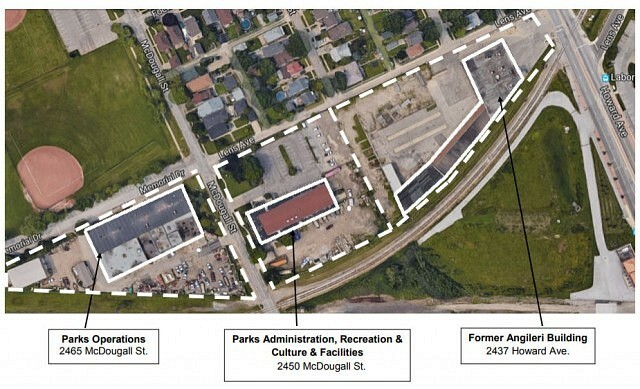 According to a report written by Tom Graziano, Senior Manager of Facilities for the city, there are currently 58 administrative and supervisory employees located at 2450 McDougall and 2465 McDougall. Since the creation of a new leadership structure for the dependent in March, some employees will need to be moved to the McDougall offices. Administration is recommending that the city renovate the former Angileri building with the intention to make use of the building and create a “campus” site for the administration and operations of Parks, Recreation, Culture, and Facilities. This would allow the staff to stay nearby to attend meetings and liaise with other staff that they deal with on a regular basis. Renovations needed to the first floor include installation of City network connection, security system, flooring, ceiling repair, HVAC and roof repairs. The renovation would include office space, a lunchroom, meeting space, accessible washrooms and a reconfigured entrance. The city says up to 12 employees would be relocated to the new space. Total budget is estimated at $ 1,000,000. It goes to council for approval on October 16th, 2017.